Bill modestly credits his successful career in racing, not to his talent, but to a passion for motorcycles, a life-long love affair beginning at age 16 in 1950. He rode street bikes as a chief means of transportation for thirty years and owned and/or rode over 50 different motorcycles on the street and in competition. 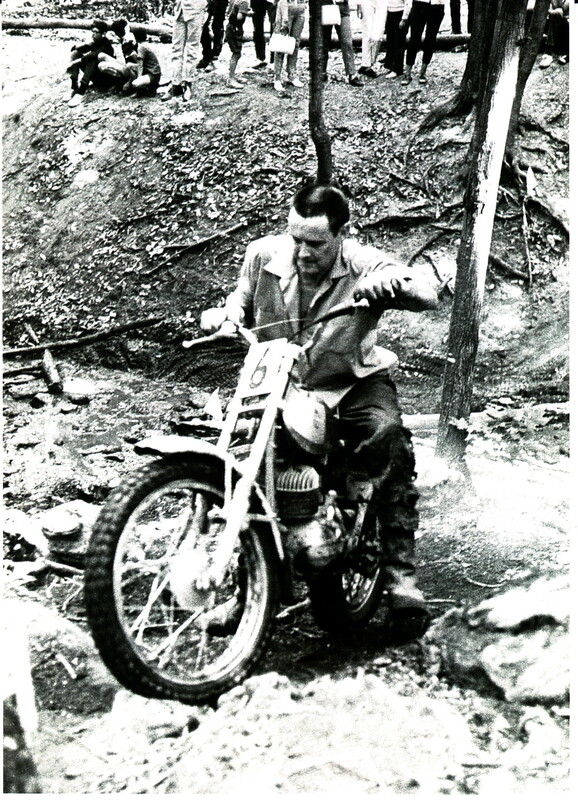 Scrambles, Enduros, Trials, Road Racing, Dirt Track and Ice Racing in a career that spanned twenty-two years Bill Sharpless rode them all. He approached each motorcycle discipline with enthusiasm and intensity. He earned himself a solid reputation and a closet full of championship trophies and titles. He started racing in 1953 when motocross was called scrambles and few serious dirt bikes were available. Most off-road competition was done on motorcycles that were little more than modified street machines. Bill Sharpless Historical from Northern Ontario Motorcycle on Vimeo. Bill was born and raised in Toronto, Ontario and lived there all his life. Unlike most of his peers who sacrificed post secondary education to go racing, Bill studied mechanical and aeronautical engineering at the University of Toronto and spent those summers taking pilot training in the RCAF. In addition to his motorcycling activities, Bill was an avid skier, often spending time at Blue Mountain with Don Haddow and other motorcycling buddies. As a founding member in 1952 of the Nortown Motorcycle Club located in the Lawrence Park area of Toronto, Bill was a competitor in or an instigator of, coasting races in the King City highlands, night time trial rides in the Don Mills area (before houses) and sanctioned scrambles in the Jane and Finch Streets area of Toronto. The club eventually became one with many competition riders in it including John DeGruchy, Ivor Lloyd, Hart Kennedy, Hugh Lim, Dennis Massey and many more. From 1954 to 1965 (except for a two year stint in the Royal Canadian Air Force) he served the Nortown Motorcycle Club as either President or Treasurer and spearheaded the organization of more than one hundred events. Bill treated motorcycle competition as a hobby rather than a vocation although he did have sponsorship from several factories and companies. Being a partner in a thriving motorcycle business which was competition oriented, meant that participating in enduros, trials and twenty-four hour endurance road racing was good for business. It didn’t hurt that his partner, John DeGruchy was a serious competitor himself. The business Sonic Motorcycles located in Scarborough, was over the years, a dealer for BSA, Bultaco, Ducati, Suzuki, Kawasaki, BMW, Honda and Can-Am and had a healthy motorcycle service department as well. John and Bill started the shop in 1966. Bill bought John out in 1976 and Bill sold in 1981 for health reasons. 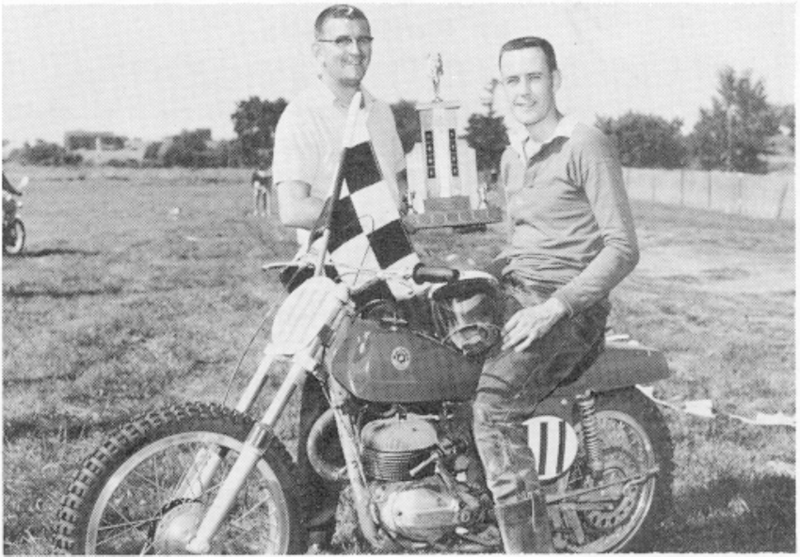 Sharpless won his first Canadian Championship in Enduros in 1955 on his modified 650cc Ariel Huntmaster. His first road race was on an ancient bronze head Rudge at Edenvale. 1956 and 1957 were spent in the RCAF, stationed in New Brunswick where he organized the Maritimes first Road Race and first Enduro. He returned to Toronto to an engineering job at De Havilland Aircraft and began motorcycle competition in earnest. 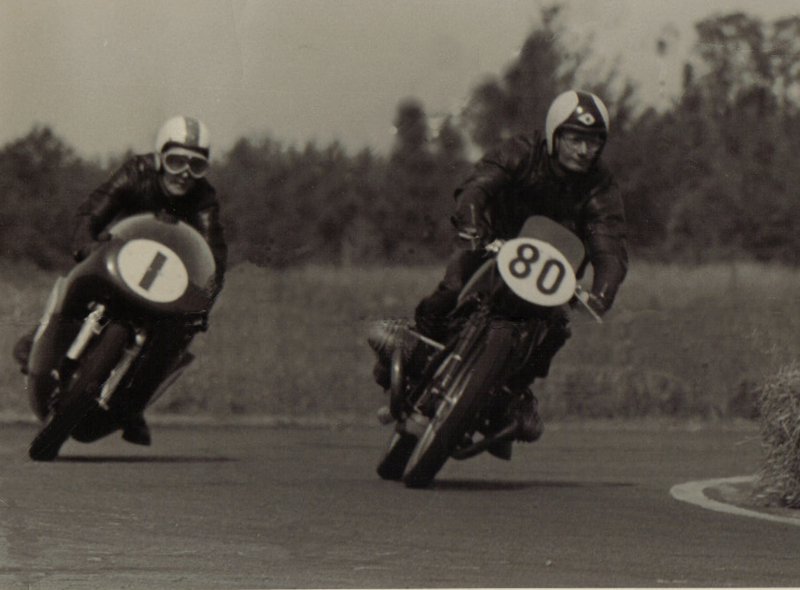 In 1959, Bill invested in a 500 factory kitted Matchless for the Expert Scrambles Class. He described it as ferocious, fitted a straight copper pipe and thought it was perfect until it threw him six days before his wedding. When Bill married Elaine, he stood straight and erect, a broken collar bone strapped up with a figure eight support. Elaine was a nurse, a definite asset to a racer. Bill’s list of accomplishments include: winning the CMA White Trophy four consecutive years as top Canadian Competitor, a bronze and a silver win at the International Six Days Trial, one Canadian Trials Championship, two years running as Canadian 500cc Scrambles Champion and four Canadian Enduro Championships including three Corduroys. In 1962, Bill was leading the Daytona Speedway Amateur race over half way on his converted Triumph 500 Scrambler, when he was involved in a serious crash, suffered a broken leg and spent two months in the Halifax Hospital in Daytona. After his recovery, he had to limit his racing to trials and enduros. His major target was the British Empire Motorcycle Club’s two day Corduroy Enduro which has been held annually since 1952. Bill won this event three times. 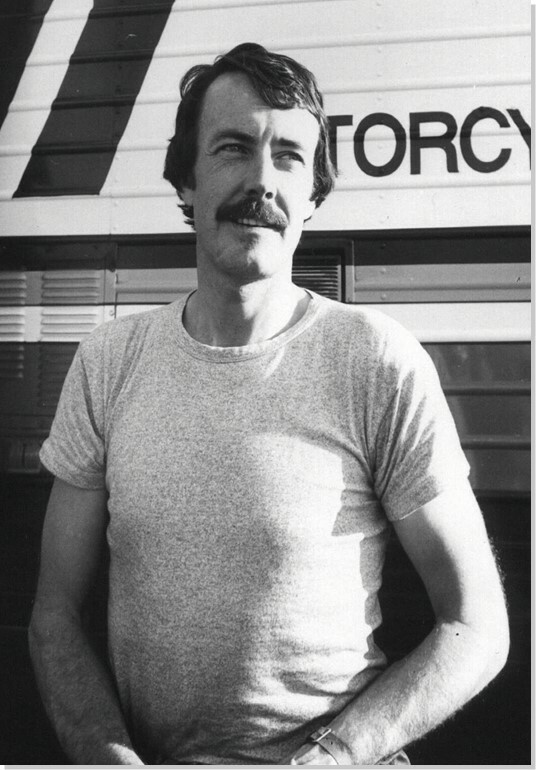 After retiring from all competition in 1975, Bill continued to put back into motorcycling for many years by involving himself with the scoring calculations for several enduros, especially the Corduroy held in the Haliburton area of Ontario. In addition, Bill got involved in duplicate bridge competition, winning his first tournament in 1981 and eventually ran three bridge clubs and organized competitions and events. Bill and Elaine had three children, Toni, Blair and Todd, all of whom became successful motorcycle competitors. Bill was inducted into the Canadian Motorsports Hall of Fame in 1996. This was the first motorcycle event that his Mother ever attended. Bill Sharpless passed away in 2007.